Hartfield Dole, Nicholas Smith bequest. Easter Good Friday at the Church of St Mary the Virgin Hartfield Sussex Uk 1975. 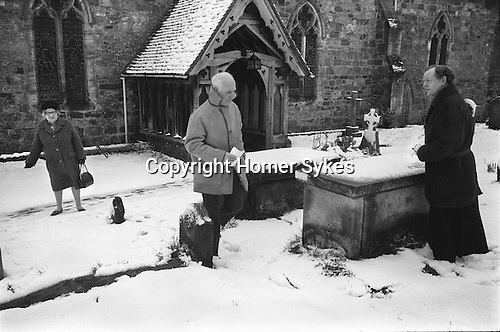 The graveside dole takes place at the grave of Nicholas Smith who died in 1631. In his will he left money that was to be invested and the interest to be divided between the poor of the parish on Good Friday. Smith was a rich resident of East Grinstead, who went around the parish dressed as a tramp begging wherever he could for food and shelter. He was treated with contempt everywhere and sent on his way, apart from in Hartfield, where he was treated with generosity and compassion. In his will he stipulated that he should be buried in Hartfield and a charity set up bearing his name. In 1975 two parishioners claimed the dole.